The Egyptian-German summit between President Abdel Fattah al-Sisi and German Chancellor Angela Merkel began Tuesday afternoon, at the German Chancellery in Berlin. 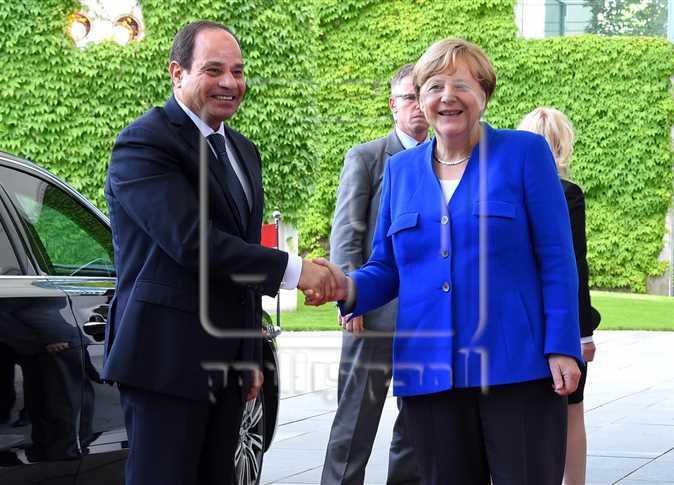 Merkel received President Sisi at the Chancellery’s entrance, where they stood for photos. The summit will discuss issues of common interest and regional issues, especially the situation in Syria, Libya, Yemen, illegal immigration, counter-terrorism, and means of boosting bilateral cooperation between Cairo and Berlin in various political, economic, and investment aspects. It is the sixth Egyptian-German summit between President Sisi and Merkel. The summit comes after Sahar Nasr, Egypt’s Minister of Investment and International Cooperation, met with a delegation of the Bundestag on Sunday, to discuss mutual trade and investment. Germany investments in Egypt amount to $641.4 million, across 1,103 companies working in Egypt in the chemicals, oil, telecommunications, gas, automotive industry, iron and steel sectors, Sahar observed. She stressed the importance of increasing developmental cooperation.